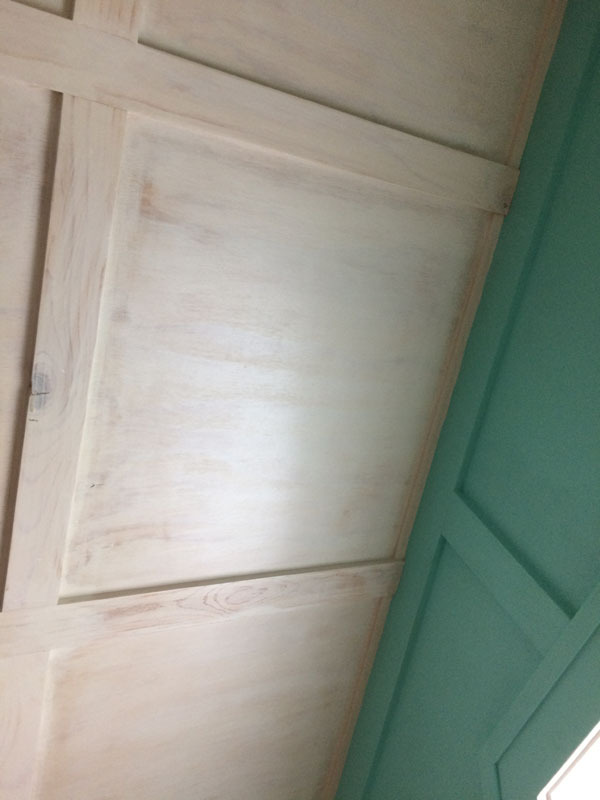 Here is the final post for the pesky pointy closet. As I write this, I’m still working on this space. The final floors will go in soon on the second floor, so all is ready for this final step. So let’s finish this up, shall we? We left off from post #2 looking like this. Well, it’s pointy enough, but this is a vintage house built in 1935. Seems like it needs a little more character than just drywall everywhere. So since I have several rooms with wood on the ceiling and walls, let’s panel the front wall with a little board and batten. We’ll cover the surface with plywood and make it look and feel authentic. OK.
Let’s just panel the whole room. This will give it a little more of the vintage feel – and will take a couple more weeks to get to this point. 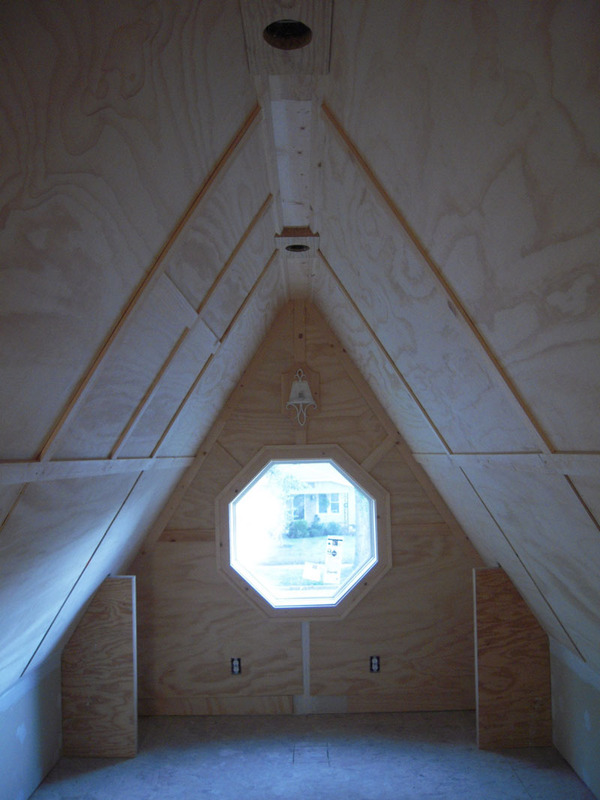 And we just keep covering the wall/ceiling with 1/4″ plywood and rabbeted wood battens. I added a light block to the front wall and a little wall sconce above the window. In my mocked up design I’m planing to add a shelf along each side over the ‘wings’ that protrude out from the sides of the closet. I contemplated a painted shelf, or some type of wood. I didn’t want to spend a lot of money on the shelves. They’re 10′ long on each side. So I went to Menard’s and looked through the lumber section for some ideas. I came up with some cedar that I thought would work, but it wasn’t wide enough. So I went through the whole stack and found 2 pieces of 1X10’s and 2 pieces of 1X6 that were nearly a perfect match. I glued them up and sanded then down and they look pretty good. You can see the seam running down the middle. A test fit to see if the shelves are the right width. I made these 12″ wide. The closet is not very practical, so we’re going to make it as useful as possible. I thought the shelves would be slightly helpful. Having the shelves test fit out of the way, we can add a little finish to the sanded shelves. A mixture of boiled linseed oil, varnish and mineral spirits give the grain a little depth before the final finishes go on. 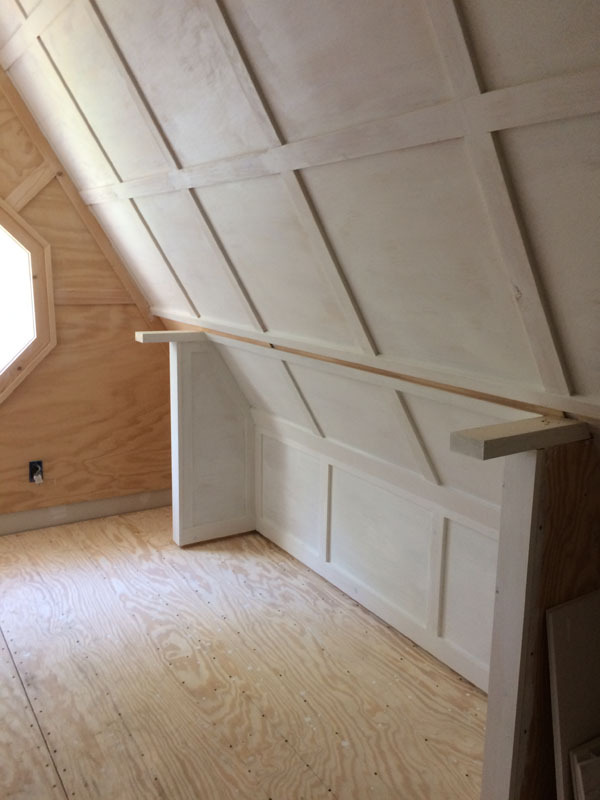 While the shelves are being finished, the board and batten details are added to the lower sections of the closet. We had to make a little do-dad detour around the vent as well. The finishing is going on. A mixture of 50/50 latex paint and water. This is put on to allow the grain to slightly show through. A few coats of wipe-on polyurethane and we have the shelves ready to go in. Now we just have to finish the walls. The white washed walls are finished. The openings on either side of the wing area will get fitted drawers and shelves – something I haven’t made yet. All of the whitewash is on the ceiling/walls. So now we’re going to add a little color. 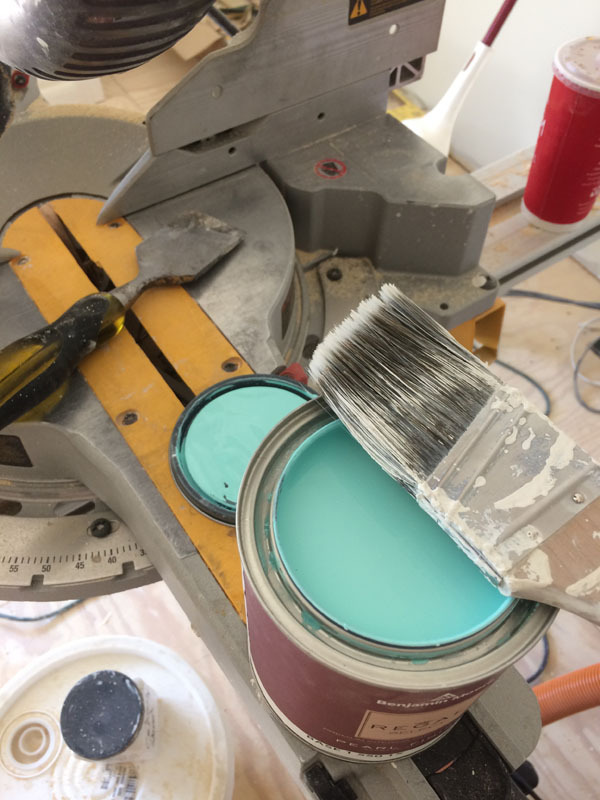 And what would be better than a nice coat of Tiffany Blue. The first coats go on to give the room a little color. 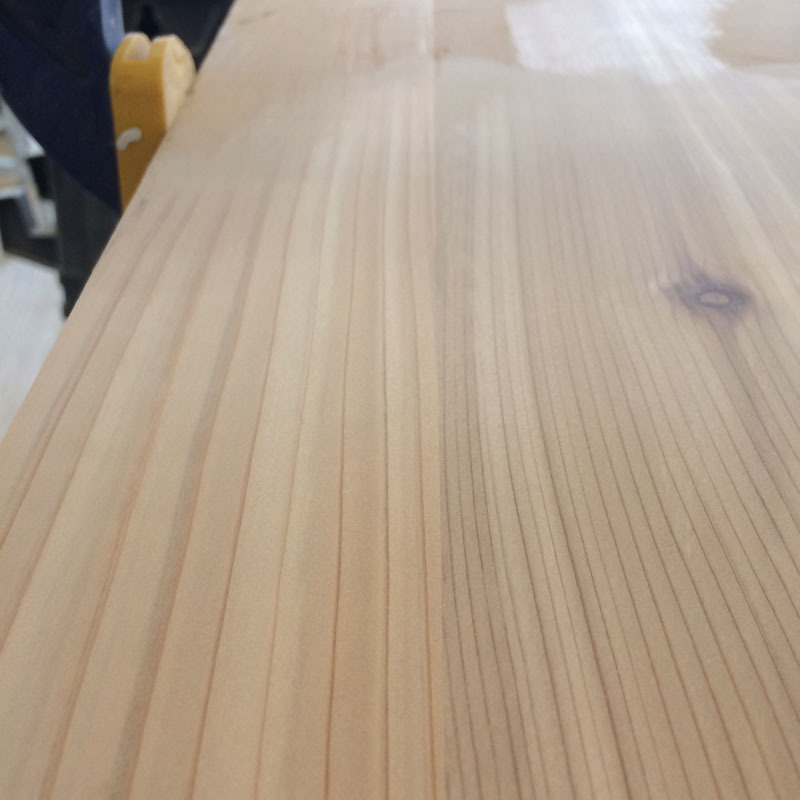 All of the surfaces get a good sanding to 220. This lets some of the grain show through. This is why I paneled the whole room. The wood panel grain showing through is the vintage feel I was looking for in this pointy little closet. 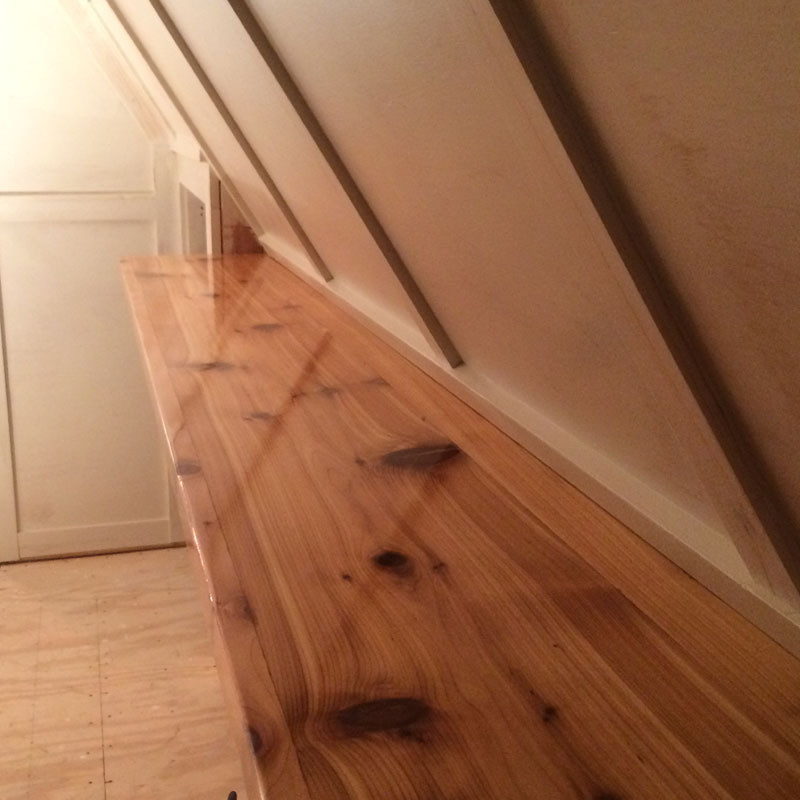 The high gloss finish on the shelves enhance the grain of the cedar. Also the bottom of the shelves are recessed. I plan on using blocks of cedar that are removable that can be recharged with cedar oil to make this a cedar closet. As usual, I looked for a long time to find this little light fixture. I thought it had a vintage, almost Scandinavian design. It has a frosted glass shade which I also like. I’m thinking this light will be used as a night light when everything is finished. Also, this blue was antiqued and over-glazed several times to give it a texture of a wall that had been painted many times over the years. Six foot closet rods are added between the wings for hanging space. One on either side will give us 12′ of usable hanging space. 8 coats of satin Varathane clear coating is needed to get a uniform sheen, with sanding between coats and finishing out at 400 grit. Does it take time? Yep, but that’s what this art project is all about. I modified the two pendant lights to make them fit the space. So that brings the pointy closet up to date. I’m waiting for the floor guy to come back and finish installing the floors. And to make this space even more impractical all of the floors on the second floor are white. Stay tuned, no telling what’s going to happen next.